In our vast experience of online bookmakers Betvictor constantly come up as one of our top bookies beating the high street bookmakers hands down on ‘Best prices’. They guarantee to be best price on Premirship football and have bigger prices in general on most of the other UK football. We notice this reguarly on straight win markets, Win & BTTS markets and Correct Score markets. 6 places paid each way in The Grand National at Aintree with Betvictor while all others offer just 4 or 5. For existing customers BV offer money back in free bets on 5 team accas up to £25 where one selection lets you down. This is one of many promos (10) that can be found on their ‘Offers’ page. T&C Apply, See below & on Betvictor Website. We have also found that they are the least likely to restrict your account or takeaway access to promotions like other online bookmakers do if you show a winning streak or strategy. Open a new account through this banner below to take advantage of all the above. T’s & C’s apply, see website for full details but here is an outline of what you get and how to use it. In our vast experience of online bookmakers Betvictor constantly comes to the top of the pile for more reasons than one beating the high street bookmakers hands down. They guarantee to be best price on premirship football and bigger prices in general on most of the others UK and european football. They offer 6 places paid each way in The Grand National at Aintree with Betvictor while others offer just 4 or 5. Open a new account through the banner above to take advantage of this offer. T’s & C’s apply, see website for full details. 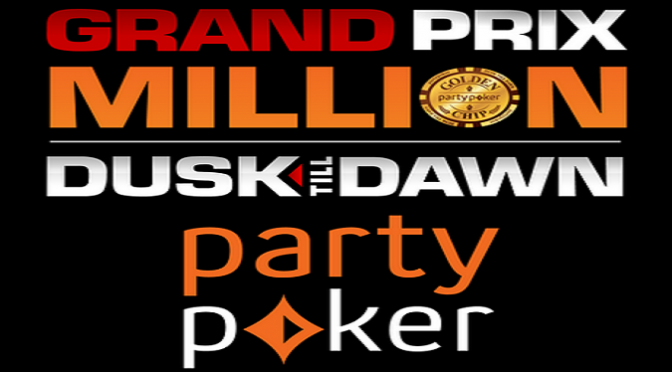 PartyPoker/DTD $1M GTD Day 1’s currently in progress. 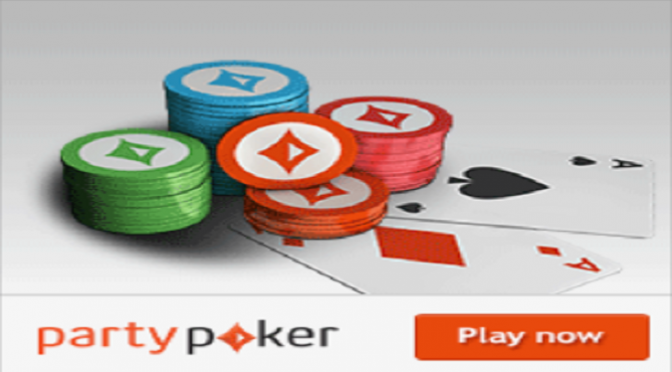 Play Day 1 online: Sign up to Partypoker, look for Grand Prix Games. There’s a Day 1 each day online, starting 7pm. Reach the Final Table with a Golden Chip and you will win $25K on top of your winnings. There will be no refund for unused DTD Grand Prix Tickets as players have the option to re-enter for a higher stack without forfeiting previous stacks. However, $120 DTD Tickets can be used for future $120 events online or live. Click on this banner to sign up for a VIP 7 account for 50% rakeback. IPOPS Mini Mon 20th April – Sun 26th April. 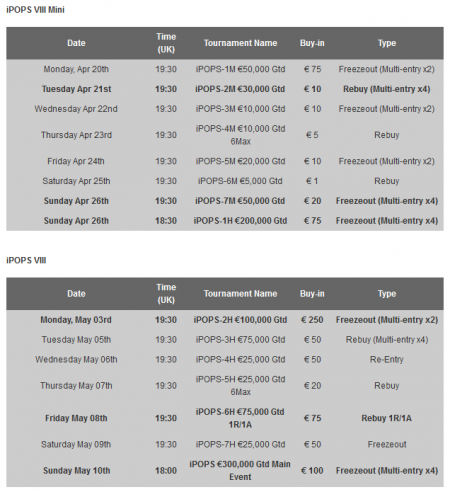 Win any IPOPS event April 20th – May 9th and well buy you into the 100 euro Main event on Sunday 10th May. Contact Us to inform us of any win since we wont know otherwise. The following satellites will be held on Pokerplex24 and only take approx 2 hours to complete with a turbo structure. Click on this banner > < for a VIP 7 acount…. Sign up for an account via any of our links or banners to play in these satellites, we will also get your account upgraded to VIP7 during your first month for 50% rakeback on all cash game rake & tournament reg fees and the upgrade will continue each month providing you rake $50 or more online in the previous month. 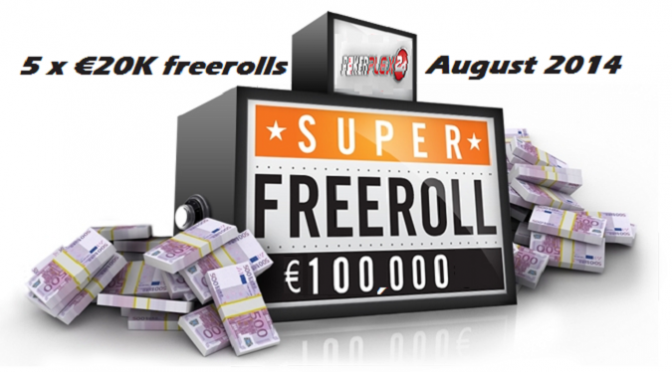 Dont miss the €100K of FREEROLLS coming up in August 2014. 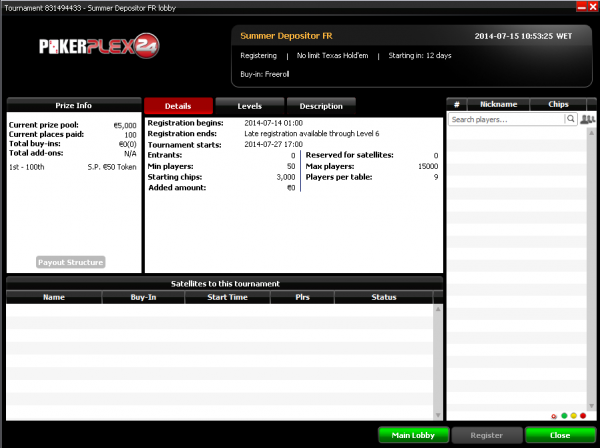 Pokerplex24 are hosting 5 x €20K freerolls that you can play. It’s a €100K promo to reward our players that deposit and play next month (August). 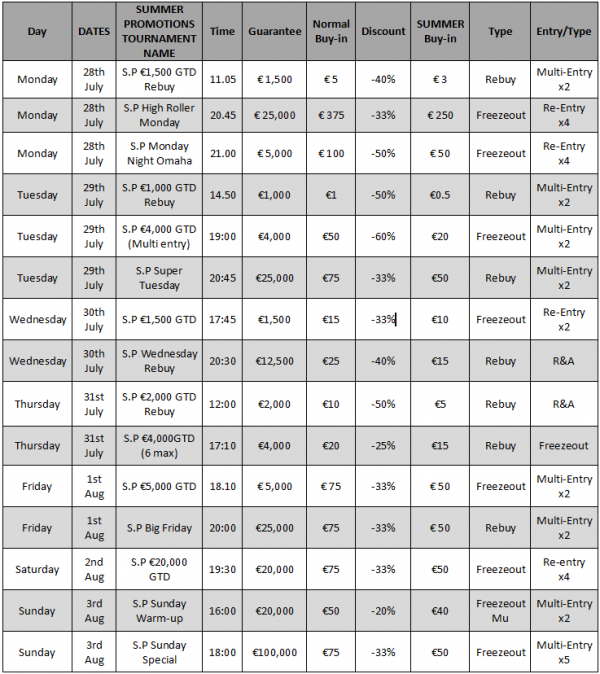 Make any deposit and pay €1 rake/reg during each of the following periods to be given a token to play each €20k Freeroll. Dont miss this one, its the last one of five! Not got an account? Click on the banner below for a special account upgrade straight to VIP 7 for 50% rakeback & £1,250 sign up bonus. Available to everyone….sign up now! 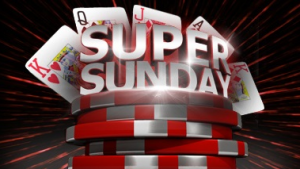 Summer Sales 2014: Play in the Summer Promotion Tournaments on PokerPlex24 and get 20%-60% off the entrees with over €250,000 in combined prizepools. Running from 28th July until 3rd August 2014, your chance to reach huge guaranteed prizes, for surprisingly low buy-ins, some as low as €0.50! Scroll down in the Pokerplex24 lobby to find ‘Summer Sales’. If you haven’t already got an account click on the VIP Pokerplex24 banner below for an upgrade to VIP 7 & 50% rakeback. €5,000 Depositor Freeroll: Deposit any amount ( min 10€$£ ) between July 18th – 25th and you’ll receive an exclusive token to play in Pokerplex24s €5,000 Depositor Freeroll on Sunday, July 27th at 20.00. The top 100 players will each win a €50 token, which will be valid in any of the €50 entry Summer Sales tournaments. 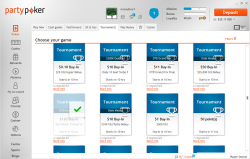 Tokens can be used immediately to register to the tournament of your choice. Happy Hour: is back once again to cheer you up following the end of the festive season! During the month of January, Pokerplex24 is offering all cash game players, the chance to earn up to 50% more points during the Happy Hour Promotion. All you need to do is play on our Cash Tables during the days/times shown in the below time table and you will earn 50% more points on top of your usual earnings to cash in as you please. Make sure you don’t miss this fantastic opportunity! Reload Bonus: If you rake or generate fee of X amount in January and then deposit X amount in February, we will reward you with a reload bonus up to $2000 !! There has never been a better time to become a loyal Pokerplex24 player because the more loyal you are, the higher we will pay you ! Sign up using the banner below and contact matt@rakeaddicts.com so we can also apply a special VIP 7 upgrade to your account.